Alvord Lake in northwestern Montana provides public access and wildlife habitat. Vital Ground and a stakeholder collaborative manage Alvord Lake Community Forest. Forest thinning, prescribed burning, and education were hot conversation topics on March 6, when a group of volunteers, community members and representatives from organizations and agencies in northwestern Montana met to discuss future management and opportunities at the Alvord Lake Community Forest. In case you haven’t heard about it, the Alvord Lake Community Forest is a 142-acre open space located along Alvord Lake, just to the northwest of Troy, Montana. In the early 2000s, a group of neighbors took a leap of faith and purchased the land in order to prevent subdivision and keep it accessible to the public. The community held on, waiting for a long-term solution, and after 12 years the answer was found: a land trust to own the land; private, federal, and state funding to purchase the land; and community groups and volunteers to help manage the land. 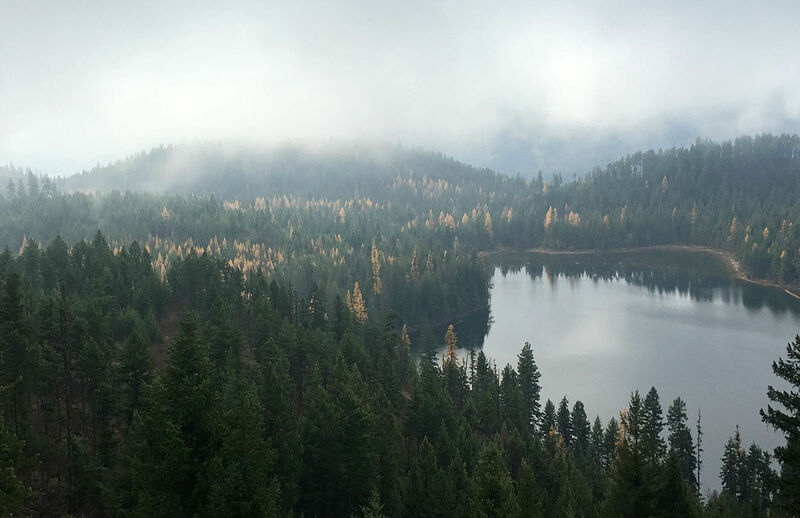 In 2016, a collaborative including Montana Fish, Wildlife and Parks, the Society of American Foresters, Vital Ground, the U.S. Forest Service, and other local organizations and individuals established the Alvord Lake Community Forest. Together the group mapped out the purpose of the space: to manage it as a productive forest while also improving forest health, restoring native plants, protecting important fish and wildlife habitats, continuing and expanding opportunities for outdoor education, and maintaining historical trail access and public uses including fishing, boating, and dispersed recreation. The community forest designation hinges on community participation in future planning and decisions. While Vital Ground owns the land, we manage the forest with input and assistance from stakeholders. One way we engage stakeholders is to hold regular meetings to discuss management decisions and opportunities for the local community to get involved. In partnership with the Forest Service, the Montana Department of Natural Resources recently awarded a federal Landscape Scale Restoration grant to Vital Ground, meaning there are now financial resources available to implement the management work set out in the Alvord Lake Management Plan. On March 6, our stakeholder group met in Troy to determine the best way to use this funding over the next three years, while also reviewing accomplishments, prioritizing management actions, and brainstorming ideas about additional outreach and education. In the two years since the community forest was established, on-the-ground management has been ongoing. 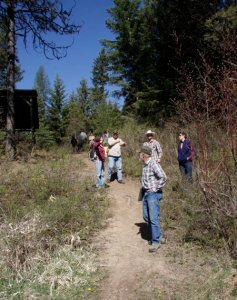 This includes over 40 acres of thinning to improve forest health and reduce wildfire risk, trail maintenance to maintain access on the loop trail around Alvord Lake, reducing noxious weeds through hand-pulling, targeted herbicide use, and release of biocontrols (insects that specifically target an invasive species without damaging native plants). In addition, numerous school groups from Troy visit Alvord Lake every year for environmental education field trips. Work over the next three years will build on these accomplishments. The stakeholder group prioritized additional forest thinning totaling about 70 acres, a prescribed burn on approximately 20 acres, tree planting to restore forest diversity, and continued noxious weed control. The group also identified short-term and long-term goals to increase signage about the community forest which will help raise awareness about its history, goals and importance. Throughout the next few years, we will also provide opportunities for tours of the forest, so that the community can see what is happening on the ground and get engaged. Stay tuned for upcoming events at Alvord Lake!